The Dominions - The Success or Failure of Nations. DOMINIONS - The Success or Failure of Nations! The Dominions are the fourth ranking Order or Choir in the Second Hierarchal Sphere of the Hierarchy of Angels, are part of theHeavenly Governors and according to Jewish traditions, are attributed with the success or failure of nations was decided by this Order of Guardian Angels as they are the angels who preside over nations. They oversee the workforce in the heavens, delegating duties to other angels. Dionysius claims that the angelic lords, Dominions (Latin: dominatio, plural: dominationes), also known as the Hashmallim hold the task of regulating the duties of angels who interface with the cosmos and with us, the people of the world. They liaise with the angels in order to make sure that the proper things and attitudes are shown to us in order to preserve our happiness. It is said that "The Law of Cause and Effect" flows through them, and that they govern the forces of chaos, especially unruly passions. They bring the teachings of intuition but it is only with extreme rarity that the angelic lords make themselves physically known to mortals. Instead, they quietly concern themselves with the details of existence. These Divine Beings are believed to look like divinely beautiful humans with a pair of feathered wings, much like the common representation of Angels, wearing long albs, or gowns reaching to their feet, hitched with a golden belt. They are physically characterized from other groups as wielding orbs of light fastened to the heads of their scepters or on the pommel of their swords. 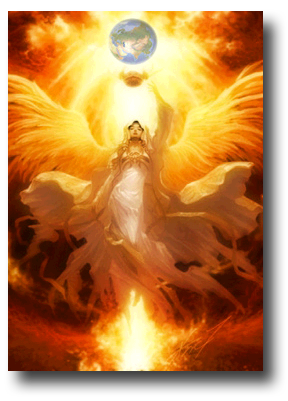 Known as the "Spirits of Wisdom"
Their duties are both regulated to the realm of Justice as well as Mercy and they have been tasked with the duty of seeing to the physical and spiritual worlds and it is said that Archangel Zadkiel leads this order.